I have taken a complete blogging break over the school holidays. Magoo likes to be out and about as much as possible. Plus my Mother-in-Law came to stay for a week, so I wanted to give them both my full attention. Our holiday was filled with trips to the park, meeting up with friends, walks to the allotment, bike rides, ice creams and lots of trampolining. We seem to be a little bit out of step with our Easter Holiday break. Most schools had their holidays around the bank holiday weekend. Ours started a week after the Bank Holiday weekend. Although it has been a bit grim and grey at times, we have enjoyed the occasional burst of Spring sunshine. Saturday was a bright and beautiful day, so we decided to make the most of the sun and head to the beach near our home. 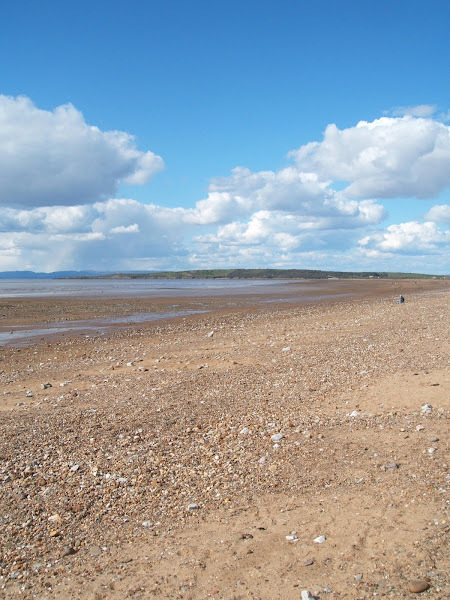 We love this particular beach because there are lots of places to explore. Along the tide line you can often find interesting pieces of drift wood, pebbles in a hundred and one different shades and sometimes the odd fossil. Due to high tides and Winter storms, the sandbanks were more exposed than usual. It looked like large chunks had been washed away. 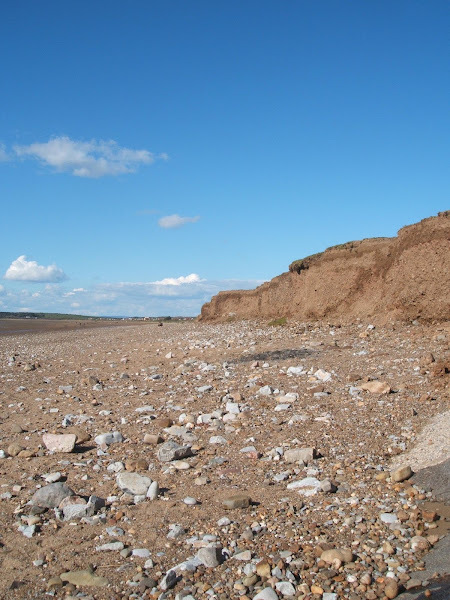 We could clearly see the exposed layers of sand, stone and shells in the bank. Magoo and Mr M couldn't resist having a dig around to see if there were any fossils or interesting stones to be found. We particularly love finding pebbles containing quartz because they glitter in the sunshine and look like jewels. We took bucket and spades, beach mats and a frisbee. Magoo loves the frisbee, and spent quite a while throwing it into the air just for the fun of it. 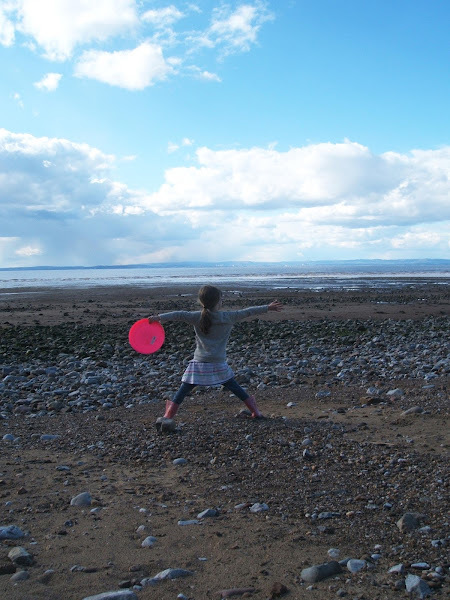 I really wanted to try and capture a photo of the neon pink frisbee against the blue sky and Welsh coastline in the distance. We also spent some time collecting stones to write messages in the sand. I though it might be nice if another family or a dog walker found our 'LOVE' note later on in the day. 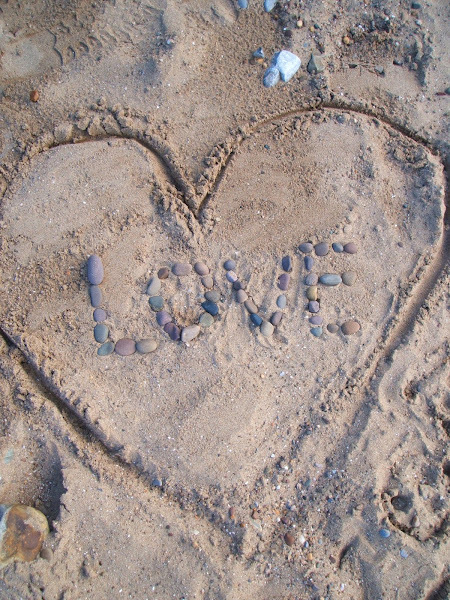 I hope it survived the tide coming in...but if it didn't, there's plenty more pebbles to write a new message next time we're on the beach. Looks and sounds great. I wish we had more places like this close to us. What a lovely of! 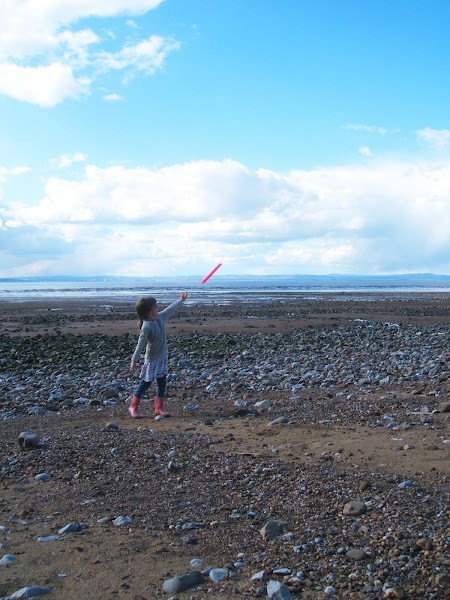 My kids would have tried to bring home every pebble on the beach. They LOVE rocks and think each one is special. What a lovely time on the beach. It looks like a fantastic place to explore and have fun. We love hunting for shells and other interesting things on a beach. 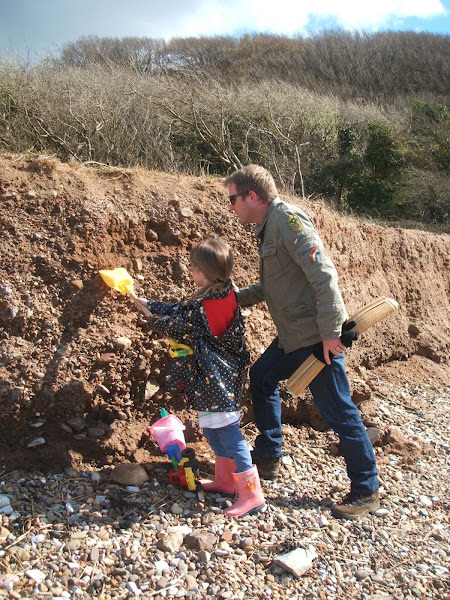 What a great day out, we love exploring beaches, searching for shells and fossils. thank you for all your lovely comments, we love this beach. I haven't spotted much seaglass on this particular spot. I think it can be quite hard to get hold of in certain areas...I will keep my eyes peeled next time we're down there!